In this single blind study, 64 volunteer subjects responded to newspaper advertisements, 32 males and 32 females, ranging in age from 22 to 55 years old (mean = 36.64), who scored 50 or above on the State Trait Anxiety Inventory (STAI), completed informed consent and were randomly assigned to 20 minutes relaxation training (RT) on audio tape only, Alpha-Stim CES only, RT plus CES, or to a control group which listened to a neutral audio tape and received sham CES. There were 8 males plus 8 females in each group. 9 of the original 73 subjects were dropped from the study due to failure to meet the study criteria or failure to show up. Treatment time was 1, 20 minute session, and relaxation was measured by frontalis muscle electromyogram (EMG) and a post treatment STAI. Subjects responded on the STAI significantly (P<.001) better than controls and equally to either RT alone with a means of 52.88 pretest to 32.19 post, CES alone: 52.31 pre to 30.06 post, or both RT and CES together: 53.69 pre to 30.44 post. The control group only dropped from 53.25 to 51.94. The EMG trend paralleled the STAI with means of 15.64 µV to 11.10 post test in the RT alone, 17.12 to 11.17 µV in the CES alone, 17.41 to 9.77 µV in the combined group, and 14.14 to 14.47 µV in the control group. Analysis of variance for EMG scores showed highly significant F-ratios for the time variance term and the group X time interaction term. Results were further verified by Tuckey’s tests for pair-wise comparisons. 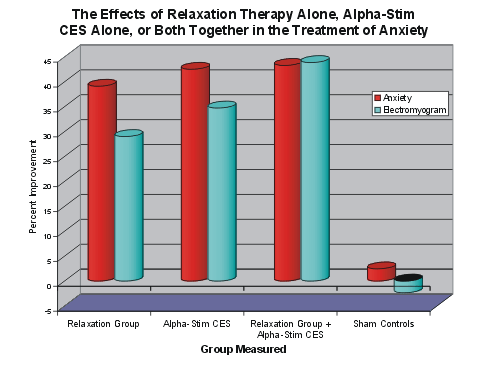 The authors concluded that the results of this study indicates that the Alpha-Stim may be a useful adjunctive therapy for short term treatment of symptoms of anxiety. The treatment appears to have about the same efficacy as the same amount of time of relaxation instructions, but is easier to administer. No side effects were reported. The graph shows how the three treatment groups fared on anxiety and EMG testing, with each of the three groups significantly improved, while the controls did not change significantly.